Japanese Episode AG 037: "Bijo to Yajuu!? Daatengu to Joi-san!" American Episode 309: "Jump for Joy!" 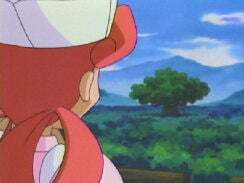 While typing on her computer one day, the Joi of a Pokemon Center between Kaina City and Kinsetsu City is kidnapped by the pokemon Dartengu. Satoshi and his friends arrive at the Center , where they use the building's security cameras to figure out the whereabouts of the missing Joi. The gang makes its way to a large tree in the middle of the forest, where they suspect Joi is being held. On the way, however, they are attacked by a number of grass pokemon who are trying to prevent the young trainers from reaching the tree. Meanwhile, Joi is able to figure out that the reason she was kidnapped was because the Dartengu wanted her to take care of a Konohana who had fallen sick. Eventually, Dartengu is forced to go down itself to stop Satoshi, but Joi interferes to tell Dartengu that she'll take care of its friend. The Konohana eventually gets better, so Joi is able to return to the Pokemon Center. After getting his pokemon healed, Satoshi and his friends continue their journey. This was a great episode and a great improvement from the last one. While the plotline was a bit clichéd, it was handled in a way that made it seem interesting. I liked the fact that the anime presented Dartengu as being a really powerful pokemon, since that honor is usually reserved for psychic pokemon and the legendaries. Plus, the Kimori vs. Dartengu fight was choreographed really well, and it remains one of my favorite battles in the series. The dub wasn't up to its usual quality. 4Kids really needs to go out and actually play the games this show is based on, because if they did I'm sure the dub wouldn't have as many errors as it does. Some may argue that the employees are way too busy to take the time to play through the RPG's, but edits like the last scene substitution at the end of this episode make me think otherwise. Three seconds are cut from the beginning of the episode. No surprise there. 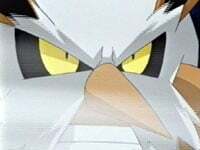 Apparently, 4Kids thinks that Sleep Powder and Stun Spore are the same attack, because throughout the episode they mistake one attack for the other. Whenever someone in the dub says "Stun Spore," the characters in the Japanese version were saying Nemuri Gona ("Sleep Powder"). I mean honestly, it doesn't take a genius to figure out what the attack is when we SEE Satoshi and Pikachu fall asleep from the powder's effects early in the episode. Whenever a grass pokemon uses the Bullet Seed attack and it hits the ground, there's a machine gun sound that, depending on the scene, is either muted out or has the volume reduced to some barely audible level. I actually expected this edit to occur, since I can imagine some parent listening to the show in the background and wondering why he or she hears a machine gun followed by people screaming in a show like Pokémon. A second is cut from the shot of Shiftry staring down Nurse Joy right before the main commercial break. 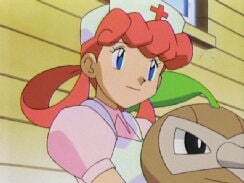 You know how, in the dub, we see Ash and the gang walking away from the Pokemon Center, and Ash makes some comment about how he hopes Nurse Joy forgets Brock's girly scream? And then we see the footage of Brock riding on Shiftry being replayed from earlier in the episode? Well, that didn't happen at all in the original version. Originally, Takeshi guesses what will happen to Dartengu, to which Satoshi more or less agrees. So they're not even talking about Joi at that part in the original. We then see two shots of Joi; one shot has her waving to the gang before turning around, and the second is a shot of her looking at the tree in the distance. For the dub, these two shots of Joi are cut and replaced by the footage of Takeshi riding on top of Dartengu from earlier in the episode. I think this is the first time 4Kids has done a pointless scene substitution for Pokémon since "The Path to the Pokemon League" way back in Kanto.